Robert Emmet Hurley was born July 31, 1947 in Jersey City. The son of a Jersey City police officer, Bob grew up in the southernmost section of the city and attended St. Peter’s Prep, where he was a member of the varsity basketball team. After graduating in 1965, he enrolled at St. Peter’s College and played ball for a year before he was cut from the team. Bob volunteered as a CYO basketball coach in his neighborhood, and discovered he had a great rapport with young players, both as a teacher and a mentor. After graduating from St. Peter’s, he was hired to coach the freshman team at St. Anthony’s High School. The Friars had an excellent varsity—they captured state championships twice in the late 1960s, with Bob serving as an assistant. When Bob was promoted to varsity coach in 1972–73, he was able to add a third title in his very first season. The Friars went 27–2 and beat Camden powerhouse St. Joseph’s 69–56 in the Parochial C championship game. They won with what would become Hurley trademarks: crisp passing, relentless defense, and overwhelming team speed. Bob would go on to win 27 more state titles at St. Anthony’s, as well as earning four #1 national rankings. Over 150 of his players earned full rides at Division I colleges and six of those players became first-round NBA draft picks. Three came from his undefeated 1988–89 team: Terry Dehere, Rodrick Rhodes and his son, Bobby. The other three were Kyle Anderson, Roshown McLeod and David Rivers. Bob’s 2003–04 squad went undefeated and was the subject of a best-selling book, The Miracle of St. Anthony. The 2007–08 Friars also were undefeated, going 32–0 and earning a #1 national ranking despite an undersized lineup that lacked a true superstar. That team was the subject of the documentary The Street Stops Here. For many years, St. Anthony’s chief rival was St. Benedict’s Prep in Newark. For nine of them, St. Benedict’s was coached by his son, Dan, who played for his father before suiting up for Seton Hall. 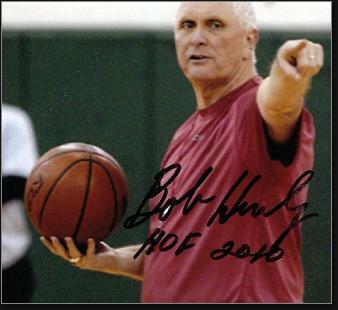 In 2010, Bob became just the third high school coach enshrined in the Basketball Hall of Fame. In 2010–11, Bob won his 1,000th game, becoming just the 10th coach in high school history to reach quadruple-digits. During Bob’s many decades at St. Anthony’s, the surrounding neighborhood slowly improved and eventually underwent gentrification. What was good for the ’hood was not a blessing for enrollment. In 2017, the school closed its doors. At the age of 70, Bob had plenty of coaching left in him. But it didn’t feel right leaving Jersey City, so he decided to retire. He attended a handful of his sons’ college games—Bobby was coaching Arizona State and Dan Rhode Island—and watched his St. Anthony’s players perform at their new high schools. Bob set up the Hurley Family Foundation, which supports local elementary and high school basketball programs, primarily through instructional clinics. Many of the kids he teaches have never played organized basketball. He likes to say it’s the Circle of Life.